Big imperial metropolises are usually considered as political, industrial, and cultural centers, but not as rich fishing grounds. However, due to the central role the Neva and Danube Rivers played in urban structure, one finds numerous places for fisheries, as well as fishers and fish traders, right in the centers of the imperial capitals and in their immediate vicinities. This section of the exhibition describes fish resources in St. Petersburg and Vienna and their role in urban life from different perspectives. Fisheries constituted an important part of local economic activities and fishers—both poor professionals and wealthy leisure anglers—were very visible in the cities’ crowds, at their markets, and on the banks of their rivers and canals. The Neva River (along with Lake Ladoga) and the Gulf of Finland were known as productive fishing grounds long before St. Petersburg was founded. Valuable fish—including Atlantic sturgeon (Acipenser sturio), Atlantic salmon (Salmo salar), and whitefish—were abundant in the river and historical records show a well-developed fisheries infrastructure, including fish weirs and fishing stations in the Neva at the location of the future city center. When the fortified port was founded, thousands of workers came to the marshy islands, and ensuring enough food for them was one of the major problems facing the administration. The fish from the Neva and its branches was apparently the only food resource that was available directly in situ and the importance of this resource can hardly be overestimated. Fisherman and Game Peddler. Illustration from the journal Volshebnyi Fonar in 1817. As a result, fishers were part of the imperial capital’s growing population since its earliest days and they were visible in various spots along the Neva, be it upstream from the city, right in the center, not far from the emperor’s palace, or downstream on the islands of the Neva delta. Fisheries became part of the local urban economy and culture. Overfishing and the worsening of spawning conditions in the Neva and in the Neva Bay of the Gulf of Finland were the most important drivers of the decline in fisheries as the city grew. This decline went hand in hand with the overall decline in the abundance of commercial migratory fish species in the Baltic Sea in general, and was in large part caused by it. Large sturgeon were only caught occasionally in the Neva River in the nineteenth century, and in the twentieth century it became extinct. The number of fishing stations along the Neva in St. Petersburg indicates the shrinking importance of the river as a local source of food: for 1831, 38 fishing stations were listed; by 1850 their number had decreased to 15, and in 1876–77 to 11; by the time of the First World War, only six remained. Fisheries to a large extent moved to the Neva Bay and to Lake Ladoga. 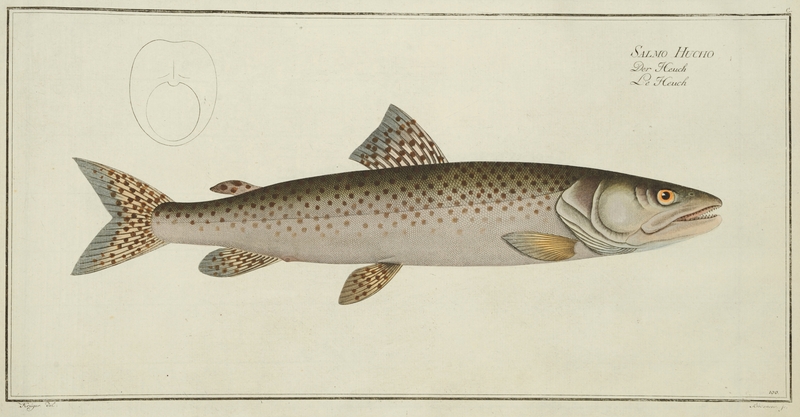 Atlantic salmon (Salmo salar) were the most valuable commercial fish in the Neva River until the late nineteenth century. Atlantic salmon come for spawning in mid-June, and this was the heyday of the season for both fishers and fish traders. Citizens used to keep a close eye on the salmon spawning and newspapers informed the capital’s inhabitants about the start and the end of the season, as well as the prospects of catches and the possibilities for buying fresh delicacies. In the 1870s, between 3,500 and 7,000 fish were caught annually and this was most probably a historical maximum. Late July was considered the peak of the salmon spawning run. Whitefish were abundant in that period, but both these species already began to decline at the end of the nineteenth century. Ivan Ivanov, Aleksandro-Nevskaja lavra so storony Nevy [Alexandro-Nevsky Monastery from the Neva], 1815. Public domain. Fishing grounds were located in the most central and picturesque parts of the imperial capital and were controlled by private owners and institutions. The Alexandro-Nevsky Monastery owned a significant portion of the Neva fisheries. Ivan Ivanov, Aleksandro-Nevskaja lavra so storony Nevy [Alexandro-Nevsky Monastery from the Neva], 1815. Colored engraving. A. Bogolyubov, Letnjaja noch' na Neve u vzmor'ja [Summer Night on the Neva by the Seaside], 1875. Held by the State Tretyakov Gallery. Public domain. The fishing grounds are situated near the industrial city center, yet the water pollution was still moderate enough to allow for a significant fish population in the river. A rack for the nets can be seen in the drawing. The fishermen are working hard during the busiest season when salmon and whitefish swim upstream for spawning. Alexey Bogolyubov, Letnjaja noch’ na Neve u vzmor’ja [Summer Night on the Neva by the Seaside], 1875. Oil on canvas, 48 x 73 cm. Held by the State Tretyakov Gallery, Moscow, Russia. Lev Lagorio, Ryboloveckie toni [The Fishing Stations], 1875. Held by the Saransk Art museum. Public domain. Fishermen use a capstan to pull the nets. The cheerful company decided to finish the White Night holiday (mid-May to mid-July) with a visit to the fishing grounds. Lev Lagorio, Ryboloveckie toni [The Fishing Stations], 1875. Oil on canvas, 60 x 100 cm. Karl Beggrov, Vid na Fontanku s Obuhovskogo mosta [The Fontanka near Obuhovskii Bridge], n.d. Public Domain. The suburban fishermen delivered their catch to the fishponds in specially constructed boats with a water basin inside. The Neva and smaller rivers were grounds for recreational fishing. The Fontanka midstream region was mainly settled with commoners, represented by the fisherman in this painting. Karl Beggrov, Vid na Fontanku s Obuhovskogo mosta [The Fontanka near Obuhovskii Bridge], n.d. Lithography, 28.3 x 41 cm. At the same time, catches of another migrating fish, smelt (Osmerus eperlanus), quickly grew. This little migrating fish, which has become a symbolic fish for the city, enters the Neva for spawning in spring. It was in high market demand and by the end of the nineteenth century smelt fisheries became the most important commercial fisheries in the Neva River. The journalists of St. Petersburg newspapers stressed that smelt was very popular among city dwellers and thus it was the main target for spring fisheries—and if the weather was bad, fishers faced serious financial problems. St. Petersburg’s populace considered Neva fisheries to offer an important summer pastime. Fishing itself was a popular recreational activity. Amateur fishers could be seen in all parts of the city and they belonged to all social strata. Even Tsar Alexander the Third was known to be a passionate fisherman, although he fished predominantly in the Gulf of Finland. 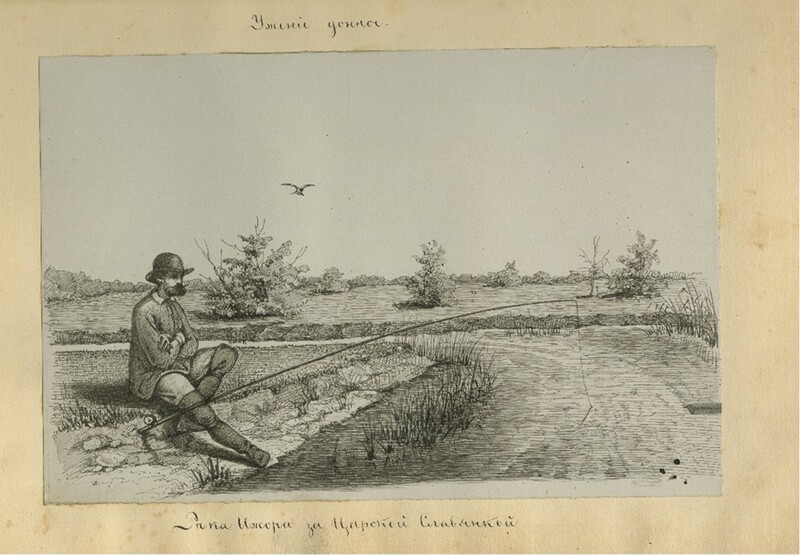 Noble anglers were also seen on the banks of smaller rivers in close proximity to the city, such as the Izhora River, a left tributary of the Neva. There they caught the local trout, which was quite the vivid experience. Another recreational activity was a visit to the fishing station, with the opportunity to have a bowl of fresh fish soup and to make a bet on the catch resulting from the next attempt to cast a net was an important part of the local urban culture. Bottom gear fishing in the Izhora river downstream from Tsarskaia Slavianka. Nineteenth-century illustration by Nikolai Liberich. © National Library of Russia. Fish was one of the most important commodities in the growing city since its early days. The city did not have a specialized fish market (just special fish lines at the common markets) until the late nineteenth century, when a special market for fish products, known as the Gorstkin market (named after the owner of the land and the buildings), was opened on the bank of the Fontanka River and became an important center for fish supply. Another part of fish-trading infrastructure included the floating fish shops known as fish ponds. Live fish transported from the areas around the city in special boats were available there. Street vending also occupied an important place in fish distribution in St. Petersburg for centuries. Both fishers and small middlemen used to sell the fresh catch on the streets. They could be seen in all corners of the city with a tub filled with water on their heads and loudly touting for buyers, praising the quality and freshness of the fish. Fisheries in the Viennese Danube benefited from a high diversity of fish. In the Austrian river section, 57 species are considered to be native. This high fish biodiversity reflects the river’s biogeographical history and the large variability of habitats, in particular prior to river channelization. Many species contributed to the diets of urban residents. Catch reports, delivery registers, and Viennese fish-market statistics from the eighteenth and nineteenth centuries list about 25 species which probably came from the urban river section or its immediate vicinity. Impressive because of its size was the European catfish (Silurus glanis). Among the most preferred were pike (Esox lucius), pike-perch (Sander lucioperca), or Danube salmon (Hucho hucho), an endemic salmonid species of the Danube basin, found only in this area. These four fish are predators and therefore less abundant than the smaller cyprinids which were caught in large numbers, such as tench (Tinca tinca), crucian carp (Carassius carassius), or barbel (Barbus barbus). The wild form of the common carp (Cyprinus carpio) was reported occasionally. The carp eaten by urban dwellers or monks came mostly from fish farms. 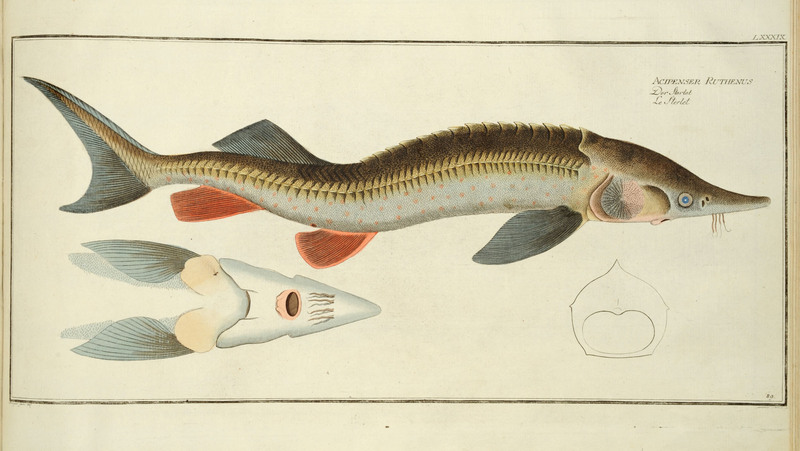 In the early eighteenth century the largest Danube fish, the great sturgeon (Huso huso), still migrated from the Black Sea to the Austrian river section on its spawning runs, although it was already less frequent than in previous centuries. The sterlet belongs to the family of sturgeons. In contrast to the diadromous Beluga sturgeon, it is a pure freshwater fish and still inhabits the Austrian Danube. Illustration by George Bodenehr and Krüger, late eighteenth century. Originally published in Bloch, Marcus Elieser. Allgemeine Naturgeschichte der Fische. Berlin: Morino, 1782–95. Plate 89. The Danube salmon is a fish species endemic to the Danube catchment. Illustration by George Bodenehr and Krüger, late eighteenth century. Originally published in Bloch, Marcus Elieser. Allgemeine Naturgeschichte der Fische. Berlin: Morino, 1782–95. Plate 100. The fishing gear used by the Viennese fishers’ guild and other fishers’ organizations was as diverse as the fish community. These organizations included the Klosterneuburg monastery north of Vienna and others in surrounding municipalities which at that time were not yet part of Vienna. They used seine nets, lift nets, traps, or lines. The monastery of Klosterneuburg also had special permission to erect fish weirs: this type of gear had already been banned elsewhere along the Austrian Danube under a fisheries law from 1506 because it was considered to be especially harmful to fish. In engravings and paintings of the eighteenth and nineteenth centuries, fishers often appear with a fishing rod. Such gear was, however, mainly used by early recreational fishers. It only became more common along the Viennese and Austrian Danube in the late nineteenth century. Joseph Wohlmuth, Blick gegen die Taborbrücke, around 1820. © Österreichische Nationalbibliothek/Wien, LW 75.021-C. Used by permission. Life along an arm of the Viennese Danube with fishers, ship mill (on the right-hand side in the foreground) and the main bridge (the Tabor Bridge) crossing the Danube in Vienna. In the background is St. Stephen’s Cathedral, Vienna. Ship mills were typical constructions for hydropower production on the Danube. Joseph Wohlmuth, Blick gegen die Taborbrücke [View toward the Tabor Bridge], around 1820. © Österreichische Nationalbibliothek, Wien. LW 75.021-C. Used by permission. Franz Caucig, Fischer im Prater, n.d. © Kupferstichkabinett der Akademie der bildenden Künste, Wien. Used by permission. Fishing with small lift-nets was typical along the Danube. Franz Caucig, Fischer im Prater [Fisherman in the Prater], n.d. Feather in bistre and brush in ink, 23 x 35 cm. © Kupferstichkabinett der Akademie der bildenden Künste, Wien. Used by permission. Friedrich August Brand, Die Fischerei an der Donau, n.d. © Wien Museum, 81547. Used by permission. Fishtraps were also common, especially on floodplain water bodies. Fish were later stored and transported in wooden tanks. Friedrich August Brand, Die Fischerei an der Donau [The Fishing on the Danube], n.d.
© Wien Museum, 81.547. Used by permission. Adolf Kunike, Dorf Nussdorf, 1826. © Wien Museum, 105.081/117. Used by permission. Recreational fishing with fishing rods was still rare at the beginning of the nineteenth century. Two small hills, Kahlenberg and Leopoldsberg (seen in the background), were preferred places to view and paint the Viennese Danube landscape. Recreational fishers are seen in the foreground with fishing rods at the Danube banks in Nussdorf, upstream from Vienna. Adolf Kunike, Dorf Nussdorf [Nussdorf Village], 1826. © Wien Museum, 105.081/117. Used by permission. Fish were sold at different places in Vienna, but the main location was the central fish market. For centuries it was located at Hoher Markt in the city center. Thereafter, it was moved to the city’s fortification walls in 1753, and to the banks of the Danube Canal after the walls were destroyed in 1858. Fish were often sold live and, from the fourteenth century, various laws were enacted to guarantee the supply of fresh fish. Until the nineteenth century, fish was often rotten because of long transport distances or inadequate storage. In the late nineteenth century, the pollution of the Danube Canal—from which the water needed to keep fish alive and fresh was taken—had an adverse effect on fish supply. Danube fish played an important role in the diet of urban residents, but despite the richness of Danube fish species and their abundance, local waters could not satisfy urban demand. 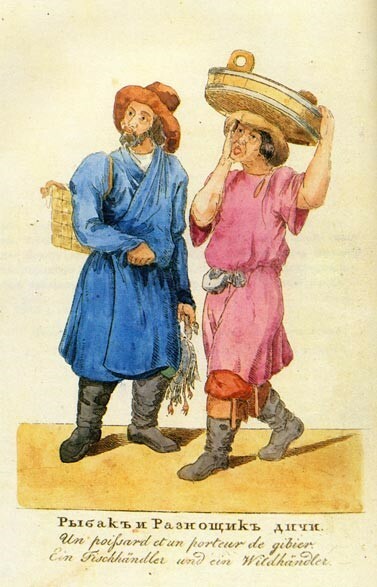 In a description of Vienna from 1547, Wolfgang Schmeltzl mentions more than 50 species that he found at the fish market. A large proportion of fish was, however, imported, sometimes by boat on the Danube and often also by cart. Until the late nineteenth century, only few marine species were sold, such as herring or flatfish. In the 1890s, the city organized campaigns to promote marine fish, which were brought in increasing quantities to Vienna, especially after 1899, when the German company “Nordsee” established fish sales in Vienna. Illustration by Johann Fischer von Erlach and Johann Adam Delsenbach, 1719. Courtesy of Universitätsbibliothek Wien, AC06593649. CC BY-NC 2.0 AT. Until 1753 the Viennese fish market was in the center of town at Hoher Markt. Beluga sturgeon were delivered by carts (see left-hand side in the foreground). Illustration by Johann Fischer von Erlach and Johann Adam Delsenbach. Originally published in Fischer von Erlach, Johann, and Johann Adam Delsenbach. Prospecte und Abriße einiger Gebäude von Wien. Vienna: 1719: 24. Courtesy of Universitätsbibliothek Wien, AC06593649, CC BY-NC 2.0 AT. Accessed on 17 January 2019. Click here to view source. Unknown painter, Der Fischmarkt, before 1858. © Österreichische Nationalbibliothek/Wien, Pk 299, 16. Used by permission. In 1753 the Viennese fishmarket was relocated to the fortification walls. Water supply remained difficult and fish were kept in tubs (right-hand side in the foreground). Unknown painter, Der Fischmarkt, before 1858. © Österreichische Nationalbibliothek, Wien. Pk 299, 16. Used by permission. Franz Poledne, Franz-Josefskai-Am Schanzl, n.d. © Wien Museum, 61.302. Used by permission. After the fortification walls were destroyed in 1858, the fish market was moved to the Donaukanal where it remained until 1972. Fish could have been stored here in tanks (right-hand side in the foreground), which were put into the water. Franz Poledne, Franz-Josefskai-Am Schanzl, n.d.
© Wien Museum, 61302. Used by permission. Obere Donaustraße, Fischmarkt am Franz-Josefs-Kai, 1899. Unknown photographer. © Österreichische Nationalbibliothek/Wien, L 25387 – B. Used by permission. An early photograph of the Donaukanal and the fish market. In 1899 fish were already stored in permanent tanks in the water. Obere Donaustraße, Fischmarkt am Franz-Josefs-Kai, 1899. Unknown photographer. © Österreichische Nationalbibliothek, Wien, L 25.387-B. Used by permission.